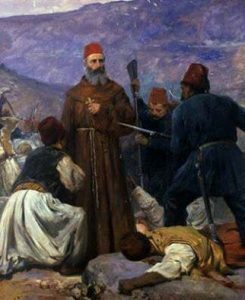 Those called the Martyrs of Armenia are understood today to be the forerunners of the WWI Armenian genocide by the Turks. “Martyrdom for the love of Christ thus became a great legacy of many generations of Armenians. The most valuable treasure that one generation could bequeath to the next was fidelity to the Gospel, so that, with the grace of the Holy Spirit, the young would become as resolute as their ancestors in bearing witness to the Truth. “The example of Christian Armenia testifies that faith in Christ brings hope to every human situation, no matter how difficult. We pray that the saving light of Christian faith may shine on both the weak and the strong, on both the developed and developing nations of this world. Particularly today, the complexities and challenges of the international situation require a choice between good and evil, darkness and light, humanity and inhumanity, truth and falsehood. Present issues of law, politics, science, and family life touch upon the very meaning of humanity and its vocation. They call today’s Christians – no less than the martyrs of other times – to bear witness to the Truth even at the risk of paying a high price. “This witness will be all the more convincing if all of Christ’s disciples could profess together the one faith and heal the wounds of division among themselves. May the Holy Spirit guide Christians, and indeed all people of good will, on the path of reconciliation and brotherhood. Here at Holy Etchmiadzin we renew our solemn commitment to pray and work to hasten the day of communion among all the members of Christ’s faithful flock, with true regard for our respective sacred traditions. These eight Franciscans were beatified by John Paul II on 3 October 1982. May the holy friars intercede for before God.